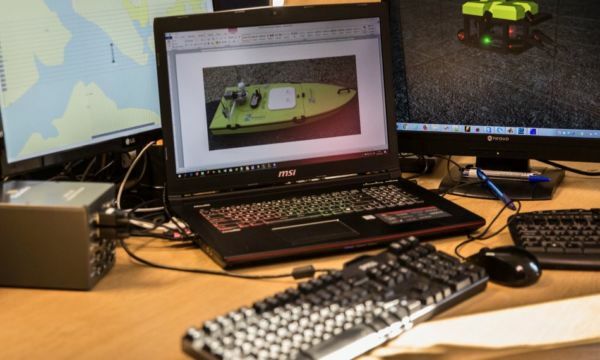 The Dynautics engineering team brings a wealth of experience in the field of software and firmware design. Most of our code is written in C or C++, and runs on various platforms including Microsoft Windows, Linux, and native embedded environments. We use an extensive library of in-house proprietary code to develop front-end operator workstation applications. These support a wide range of specialist GUI elements, serial communications, Ethernet, digital and analogue signal handling. We use Object-Oriented code paradigms throughout. Our code architecture is carefully designed using industry best practices to ensure portability and robustness. Embedded code for the ARM Cortex M3 processors is built on the industry leading CMSIS platform, which enables us to write fast, efficient code which runs on minimum power. Our Power Generation Controller module, for example, runs on just 22mA from a 12V supply. On long endurance missions, with a USV deployed for weeks on end, this can save many amp-hours, enabling the system to run more sensors, more reliably, for longer. A key feature of our data systems is the use of built-in diagnostic and low level monitoring infrastructure. As an example, this enables our clients to view data rates, quality metrics on sensor data, and in some cases raw rata from their sensors during a deployment. We have provided tools to enable the data buses to be reconfigured remotely in real time. This is a powerful tool which can dramatically shorten the time taken to test, verify, modify, redeploy and retest; this has often saved many hours of trials time, enabling systems to be optimised at sea.